The PA-12 I was flying wasn't developing full power and the oak trees at the end of the little pasture I had landed in the night before were starting to fill the windshield. I needed to decide quickly if I would rather fly into the trunks of the giant trees or pancake into the leafy tops. The choice of perhaps surviving a crash into the tops of the trees as opposed to the certain death that would come in the collision with the sturdy and massive trunks made the decision easy. I eased the stick forward and followed the gentle slope down the pasture, down to where the trees were rooted, aiming for the very bottom of the oaks as my speed built. At the last second I pulled the stick back and the aircraft zoomed toward the green expanse towering over me. This was going to hurt. I was thinking of this November 1971 experience last week when I went to Pennsylvania to inspect and fly a PA-12 in preparation for listing it for sale. The Super Cruiser I was flying in 1971 was the last one I had flown and it had the original O-235 engine developing 105 horsepower. I had purchased it for the princely sum of $1,600 to add to my flight school fleet and with it I taught flying students and I also used it for charter, hauling both passengers and freight. It was a great airplane for hopping passengers too, since the rear seat was wide enough for two small to midsized riders. It would generally haul anything you could get through the door and I recall once arriving home from Detroit with a truck transmission in the back that had been loaded by a fork lift. We almost never got it out because we couldn't get enough men around it in the confines of the cabin to lift it. On Monday midmorning, I arrived at the Finleyville-On-A-Hill Airport, which lays just Southeast of Pittsburgh, and found Jim Kirk, the affable old-airplane aficionado who would show me the PA-12, waiting for me. His hangar, where the PA-12 is stored, is one of the tiered hangars perched on the steep slope of the airport and is where he keeps his immaculate Waco UPF-7 and also his Taylorcraft. The airplane, looking like no Super Cruiser I'd ever seen, stood tall and stout on its modified gear, shod with tundra tires and resplendent in immaculate white paint and the royal purple trim that caused it to be named The Crown Royal Special. I spent a few minutes examining the airplane and I soon realized the name was appropriate for an airplane with a pedigree like this one. It was built by Cubs Unlimited with the owner furnishing an open check book, and it is obviously one of the finest examples of their work. With over 30 modifications to enhance its already legendary abilities, the airplane was stunning. I couldn't wait to fly it. I helped Jim push it from the hangar, gave it a quick preflight and belted myself into the front seat. Jim leaned in and showed me the location of all the doo dads necessary for flight under positive control, wished me fun and disappeared into the hangar. It was just the Crown Royal Special and I. My memory of how my PA-12 sounded when started all those years ago was quickly reclassified as 'tinny' when the Special came to life. The airframe thrummed with the power of the idling O-360 as I picked my way through the maze of hangars and climbed the hill (you have to see this airport) up to the runway. A run-up and checklist revealed no faults that would prevent flight, and I advanced the throttle. I've never experienced a catapult launch, but the takeoff of the Special must be similar to one. The big tires had barely started turning when the stick told me it was time to raise the tail and a split second later the slightest of back pressure peeled the big tires from the runway. It was an elevator and not a shy one either. We shot skyward and I found myself throttling back to avoid levitating into the Class B airspace above me. Slow flight reveled that with the flaps and VG's, the airplane would fly at 28 mph indicated. Control response was still excellent and a picture of all the unimproved strips where I could land this airplane and successfully take off again, danced through my head. Ah, you are wondering, what about the unsuccessful take off of my own Super Cruiser in 1971? Well, it wasn't completely unsuccessful, since we burst through the top of the Oak trees, limbs and leaves exploding in every direction and I was shocked to find we were still flying. The airplane had shuddered, shook itself and come out the other side of the tree, less some belly and gear fabric. The next day I visited the site by car and found the propeller had cut off limbs as thick as my wrist and my appreciation for the tough little airplane increased dramatically. I still have a twig incased in plastic with the date, November 1971 engraved on it. It's a souvenir from the tree that I found in the air intake of the airplane and the date is the occasion when a good airplane kept me from dying. Oh yes, and why wasn't it developing full power? I have to confess that I had taken off with the carburetor heat on, a simple and basic thing to check, but I had missed it and it almost cost me my life. Perhaps the fact that the Super Cruiser took it on the chin for me and I was spared is the reason I love the PA-12 in general and The Crown Royal Special in particular. 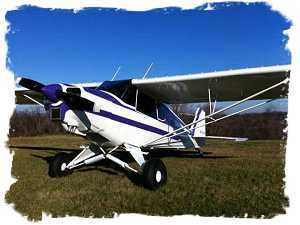 Copyright © 1997 - 2011 Steve Weaver Aircraft Sales. Specifications are based upon owner's representations, and subject to buyer's verification. Aircraft are subject to prior sale or removal from market.